← Have You Had Your Flavonoids Today? Want a Health Boost? Get a Pet! Posted on August 18, 2015 | Comments Off on Want a Health Boost? Get a Pet! As if it weren’t already enough, man’s best friend appears to provide more than companionship and unconditional love. Undoubtedly, pets can bring joy to our lives, as no one can deny the comfort that snuggling up together can bring or the pleasure we receive when we play with our pet. Research shows that owning or interacting with an animal offers a number of physical and psychological health benefits. Caring for or spending time with a pet can help reduce stress and anxiety, as well as ease loneliness and depression. Pets help to fulfill the basic human need to touch, and stroking or petting a dog or a cat releases pleasurable brain chemicals that can rapidly calm us and lower our heart rate and blood pressure. Researchers have found that dogs can not only understand our commands, they are also attuned to our emotions, body language and our tone of voice. According to the American Heart Association, the therapeutic effect of dog ownership is linked to a reduced risk of heart disease and may contribute to a longer healthier life span. One study of adults who had suffered heart attacks showed that dog owners were significantly more likely to outlive those who did not own pets. Another showed that married couples with pets had lower heart rates and blood pressure and had milder responses and a faster recovery from stressful situations. High blood pressure, often associated with a rapid heart rate, anxiety and stress, can be lowered by the positive emotions associated with the affection and relaxation brought on by petting. Studies also show that dog owners, who regularly walk their dogs, are more likely to get the recommended dose of 30 minutes of daily physical activity and that both dogs and owners are less likely to be overweight. While adults are more inclined to skip exercise if the weather is not conducive, pets want and need to go out in all weather conditions. Regular walking keeps not only pets in good physical shape, it keeps owners healthier too. Older adults with pets were found to have greater mobility and were able walk longer distances with a faster gait than those without pets who didn’t walk regularly. Dog walkers are likely to have increased social contact, as they are inclined to meet other like-minded pet owners while out walking, hiking or playing at the dog park. As older adults social circles grow smaller, feelings of isolation can grow larger. Having a pet can reduce loneliness and provide a sense of purpose, while helping people stay connected socially. Research supports that children who grow up with household pets, especially dogs, are likely to be better socialized and are less likely to be self centered, have allergies or miss school due to illness. For people in long term care facilities, animal assisted therapy provides comfort for those dealing with chronic illness and deteriorating mental health conditions. Increasingly utilized in clinical and hospital settings, trained therapy dogs help to motivate patients and speed up the healing process. Dogs can encourage playfulness and laughter, boosting immune and mental health. Therapy dogs are also used by hospitals to help relieve patient anxiety before tests, such as MRI scans or other treatments. Some studies suggest that interaction with therapy dogs may decrease the levels of certain neurotransmitters associated with depression and anxiety, while increasing the level of oxytocin, a feel good hormone that helps reduce stress and boost happiness. Along with the health benefits of pet ownership comes both personal and financial responsibility. Practically speaking, in addition to love, attention and exercise, pets need nutritious food, shelter and veterinary care. Before you consider bringing a pet into your home, make sure you are committed to a lifetime relationship with your new family member. The most important thing to remember — happy, healthy pets equate to happy, healthy owners and vice versa! 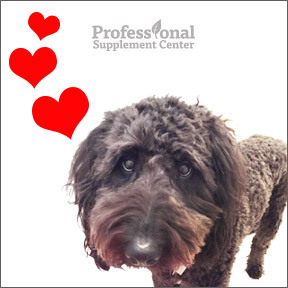 Professional Supplement Center carries many quality lines of pet supplements to support your pets’ overall health, vitality and wellness. Daily Probiotic for Dogs by Pet Naturals of Vermont – Just as humans need to support the health of their digestive tract, pre and probiotics can support healthy intestinal microbial balance for proper digestion, regularity and immune function in dogs. This delicious chewable formula features a special probiotic strain along with high quality prebiotic fiber. Canine Basic Nutrients by Thorne Vet – This complete multivitamin and mineral complex provides a broad range of nutrients in support of your pets’ optimal health and vitality. Non-GMO formulation. Also available as Canine Geriatric Basics formulated to meet the nutritional needs of an aging pet. Cardio-Strength™ by Vetri-Science – This comprehensive product features 11 synergistic ingredients and is specifically formulated to support heart muscles and cardiovascular health and function. Recommended for geriatric dogs or cats who may have sub-optimal cardiovascular functions or who may be predisposed to cardiovascular stress. Daily Multi Vitamin and Minerals for Cats by Dancing Paws – This unique feline supplement is designed to provide optimal nutrient levels to promote normal growth and longevity. Capsules, which contain human grade vitamins, mineral and antioxidants, may be pulled apart to sprinkle ingredients directly on food. Also available, Daily Multi Vitamin and Minerals for Dogs chewable wafers. Formula V-3 Vet-Zimes by Ness Enzymes – This unique formula provides essential fatty acids and concentrated, specially cultivated enzymes in support of optimum digestion and healthy skin and haircoat for both dogs and kitties. This entry was posted in Home and tagged Canine Basic Nutrients by Thorne Vet, Cardio-Strength™ by Vetri-Science, Daily Multi Vitamin and Minerals for Cats by Dancing Paws, Daily Probiotic for Dogs by Pet Naturals of Vermont, Formula V-3 Vet-Zimes by Ness Enzymes, Health Boost, pets, Professional Supplement Center, Vitamins and supplements, www.professionalsupplementcenter.com. Bookmark the permalink.